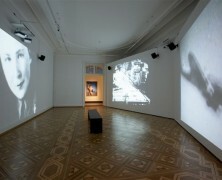 3 channel Video installation with sound, made from the original research material to SISTERS IN THE SKY- paintings. Recordings from visit to MOSCOV 1996 and Archive footage. Was displayed at OPEN SKY malmø Konsthall and OPEN SKY Kunstmuseum Thun.